Charming and elegant, Villa Nobile is the rebirth of a 12th century farmhouse that had been expanded over a period of 800 years. It is the result of a careful and loving restoration project. Among many features, the renovation preserved the original stone staircase, and the house has been decorated with refined, quality furniture and decor, giving each corner its own particular character. An easy walk from the hilltop town of Montepulciano, the villa looks out over the Valdichiana and the blue waters of Lake Trasimeno from its beautiful setting. The fully restored property consists of 5 bedrooms and 6 ½ baths and is surrounded by 10 acres of landscaped gardens with a variety of olive, fruit and nut trees and vineyards. The villa is ideal for hosting families and groups of friends. Enter through the automatic gate to a landscaped parking area that can accommodate more than five vehicles. Appointed with all of the modern amenities, the environmentally friendly renovation was also completed using the most energy efficient materials and systems. Authentic, antique treasures complement the villa's Tuscan setting. The front patio welcomes visitors with a 14th century grindstone table. Through the front door, enter the foyer and descend a few steps to the beautiful great room with sofas and a stone fireplace. A large stone arch separates the dining table from the chef’s kitchen. The kitchen is set up for those who love to cook and for those who prefer to watch. It includes a large granite island, commercial six-burner gas stove with a lovely travertine hood, refrigerator, freezer with ice machine, wine cooler, large, hand-carved stone sink, dishwasher and microwave. The great room has three French doors that open to the outside terrace with a stone “cooking” fireplace. The terrace is furnished to provide an additional dining room that can seat 12, and covered living room with exposed beam ceilings that include paddle fans. The veranda is a great spot from which to take in the 50 mile views of the valleys and lakes. It overlooks the gardens, olive trees and the stunning infinity edge pool. The windows and doors in the house are fully screened to allow the wonderful Tuscan air to flow throughout, but on days when AC is preferable, every room has individual thermostats. Another entertaining space can be found on the second floor. At the top of the stairs, situated on the same level as the Cortona and Siena bedrooms, is a large family room and balcony. Enjoy seating for 10, a large, room-heating fireplace, an HD LED 55” TV with Sky Cable, universal DVD player, DVD library for entertainment and a variety of games and books. French doors lead to the balcony with a round tile table and handmade iron chairs that is shared with the Siena bedroom. On the main level with a door into the foyer you will find the Pienza bedroom which was an addition to the original structure in the 16th century. 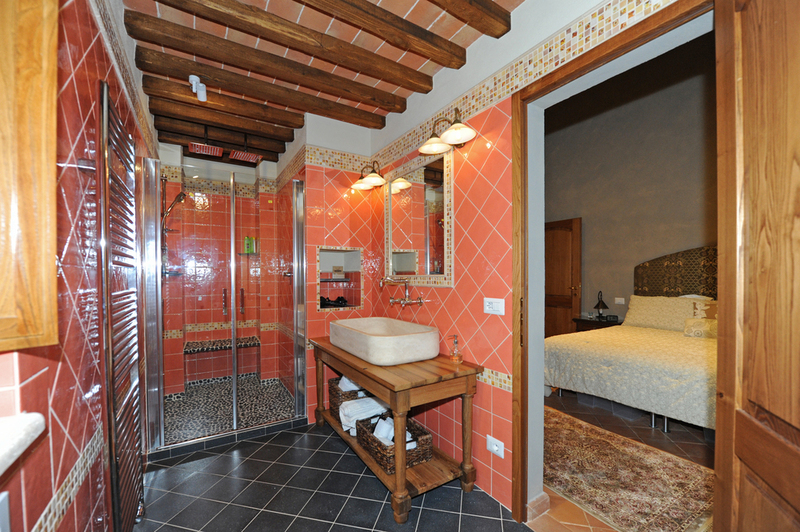 This double bedroom (king or 2 twins) has a beautiful, handmade wrought-iron bed that sits against the original stone wall, an antique wardrobe, writing desk and an ancient, beamed, terracotta ceiling. Large, rounded “barn” doors lead to the front terrace with the grindstone table and 4 chairs. The ensuite, travertine-finished bath has an open shower stall, large sink and a combination toilet and bidet (this bedroom has been designed to provide easier access for those that might have limited mobility). To the left of the foyer past the stone steps is the Montalcino bedroom. This double bedroom (king or two twins) contains the ancient home's cooking fireplace. French doors lead to the front terrace. A sleeper sofa provides a comfortable spot to curl up by your own private fire. The ensuite bath has mosaic tiles, and travertine double showers occupy the space that was once the original home’s bread oven. It includes dual sinks and a combination toilet and bidet. The ancient stone staircase, decorated by handmade wrought-iron double railings, leads up to the Siena bedroom on the first floor. The room has its own private study with a desk, chair and sleeper sofa, and a door leading out to a balcony overlooking a neighboring vineyard and up to the walls of Montepulciano. The study connects to Siena’s bedroom by way of an antique wooden barn door. This king bedroom with a hammered wrought-iron canopy bed has a handsome stone wall with a gas fireplace, antique wood shelves and a built-in closet. The ensuite, travertine-finished bath has a large, free-standing tub, open double stall shower, twin sinks, and a combination toilet and bidet. At the top of the ancient stairs to the right is the Cortona bedroom which has a king bed, dresser and shelves, and a 30’ high, terracotta-and-wood beamed ceiling with a loft, which contains a seating area (sleeper sofa) and office space surrounded by handmade wrought-iron railing and banister. The ensuite, tile bathroom has a hand-carved travertine sink, a double stall rain shower with oversized heads, and a combination toilet and bidet. On the other side of the family room is a second staircase that leads to the top floor where the Orvieto bedroom is located. This double bedroom (king or 2 twins) has a terracotta and wood beamed ceiling, a handmade wrought-iron daybed that converts to 2 beds, a desk and built-in closet. The ensuite, travertine bath has double waterfall showers, an oversized, hand-carved travertine sink and a combination toilet and bidet. Just below the veranda, overlooking the vineyards, sits a large, Jacuzzi with wonderful vistas. Stone steps lead down through the garden to the masterpiece of the property, an infinity edge pool. The pool sits under two oak trees, and is open from the last Saturday in April until the second week of October. It is equipped with an electric heat pump. The pool faces southeast and is surrounded by a scenic hilly landscape. The 42’x20’ pool has two infinity sides with depths from 3’-6’. It is surrounded by a travertine deck with teak steamer chairs. The pool has an automatic cover and a chlorine filtration system. Below the pool is a 15’x20’ overlook which has a solid travertine table that seats 10 for outdoor dining and enjoyment. On the right side of the lower level is the gym, with a recumbent bike, treadmill, elliptical, bench with a full set of dumbells, and satellite TV. On the left side is the pool bath, with shower, toilet and a deep sink. It also contains the laundry room with a large washer and dryer. On the evening of your arrival, a welcome dinner is provided. Villa Nobile's local, English-speaking concierge will introduce you to the home and surrounds. The villa is provisioned with an initial supply of basic grocery and sundry items. Maid service is available on week days. 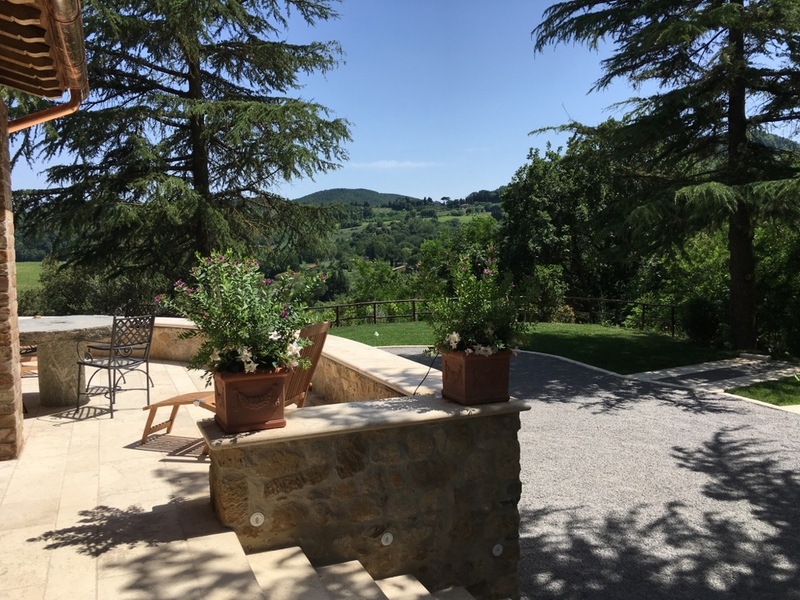 The villa is ideally situated for a relaxing holiday and is also a strategic departure point for some of the important tourist destinations in Tuscany. Easy day trips from the Villa include: Florence (68 miles) and its historical city center, Siena (40 miles) and its rich history of the Palio, San Gimignano (64 miles) the Manhattan of Italy, and Assisi (56 miles). Only a short distance from the Villa are the ancient hill towns of: Pienza (11 miles) a fabulous small town, Cortona (21 miles) the setting of Under the Tuscan Sun, Montalcino (22 miles) the home of Brunello Wine, and Orvieto (44 miles). The gem of the villa is its location. It sits right below Montepulciano, a medieval and Renaissance hill town known for its food and wine – Vino Nobile di Montepulciano. In 15 minutes you can walk to town where you'll find a variety of shops and more than 30 fine restaurants, which provide many days of great meals, wine and shopping. At one end of the street is a café to enjoy your morning cappuccino with the locals and at the opposite end is the location of the town’s Market, which takes place each Thursday. From the moment you come through the gate you will feel at home and know that you are living the Tuscan dream. Villa Nobile, situated below the town of Montepulciano. View to the north from Villa Nobile's veranda. Airports: Roma Fiumicino 128 miles, Firenze 76 miles, Perugia 47 miles, Bologna 131 miles, Pisa 119 miles, Milano Malpensa 287 miles. Train stations: Montepulciano Stazione 5 miles (for trains to and from Siena), Chuisi 16 miles, and Cortona 19 miles. Highways: A1 Autostrada exit is is 11 miles to the north at the Betolle Exit or 14 miles to the south at Chuisi Exit. Shops and services: many restaurants, cafes, wineries, groceries, art galleries, pharmacists, food markets, and other unique shops are less than 2 miles away. Access road: access is 0.7 mile from the town’s ring road down ½ mile of unpaved road which is frequented by hikers and walkers. Attractions: Pienza 11 miles, Siena 40 miles, Montalcino 22 miles, Cetona 16 miles, Firenze (historical center) 68 miles, Lucca 116 miles, San Gimignano 64 miles, La Foce 6 miles.